Richard Edward John Thomson was in Rigaud’s House from 1906 until 1909. He was interested in a military career from an early stage and joined the school’s Officer Training Corps, taking part in shooting competitions – with mixed success. He left the school after passing his Woolwich qualifying examination and in 1910 joined the Royal Military College, Sandhurst. He joined the Indian Army in 1912 as aDouble Company Officer for the 15th Ludhiana Sikhs. With this regiment he saw active service atNowshera and Lorala before joining the British Expeditionary Force on the Western Front in September 1914. He was killed in action at Neuve Chapelle on 18th May 1915. The same day, just a few hundred metres away,Lieutenant John Smyth of the 15th Ludhiana Sikhs, led ten volunteers on a perilous mission to supply bombs to the front line. Lieutenant Smythconveyed a supply of 96 bombs to within 20 yards of the enemy’s position over exceptionally dangerous ground, after the attempts of two other parties had failed. Lieutenant Smyth succeeded in taking the bombs to the desired position with the aid of two of his men (the other eight having been killed or wounded), and to effect his purpose he had to swim a stream, being exposed the whole time to howitzer, shrapnel, machine-gun and rifle fire. Smyth was awarded the Victoria Cross, Lance-Naik Mangal Singh the Indian Order of Merit, and every sepoy in the party the Indian Distinguished Service Medal. 56 years ago I joined the 15th Ludhiana Sikhs in Loralai, Baluchistan and at once became embued with the teachings and the life of Guru Nanak. The Sikh Gurus, the Sikh religion, the Gurdwara, the Granth Sahib became part of my life. The British and Sikh officers of the Regiment were convinced that religion was an important factor in the make-up of a good soldier and we fostered that in every way possible. 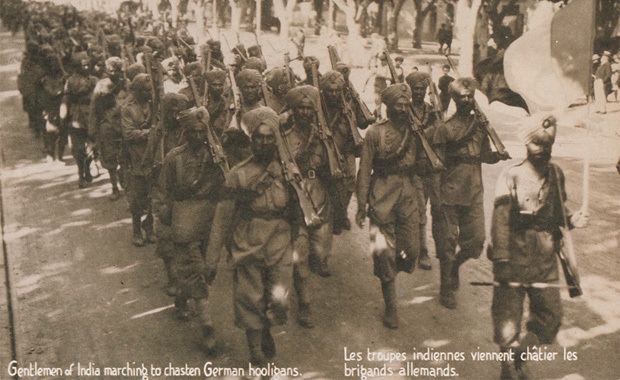 This entry was posted in The Fallen and tagged 15th Ludhiana Sikhs, Guru Nanak, Indian Army, John Smythe, Neuve Chapelle, Richard Edward John Thomson, Rigaud's, Sandhurst, Sikhism, Woolwich. Bookmark the permalink.